The transfer window has closed, and after an early exit in the FA Cup, we focus all our efforts on catching Arsenal in the race for the Premier League title. We picked up a vital win over the Gunners in January which made up for our embarrassing defeat to Brighton. Marco Asensio arrived from Real Madrid while Dejan Lovren left for China. February could be a good month for us as we have very winnable fixtures. The most challenging game of the month is a trip to White Hart Lane to face a Tottenham side hot on our heels in third. We welcome Swansea and West Brom to Anfield before a trip to the Riverside to face Aitor Karanka’s Middlesbrough. Injuries have taken their toll, but we are sticking with the 4-3-3 tactic. We lost Daniel Sturridge to last episode meaning our top scorer will play not part in this month’s games. Divock Origi proved to be adequate back-up, but injuries in training to Roberto Firmino and Sadio Mane have hurt us. I will be moving Origi out wide and give Danny Ings the starting berth up front. Our first game in February is a home tie against West Brom. 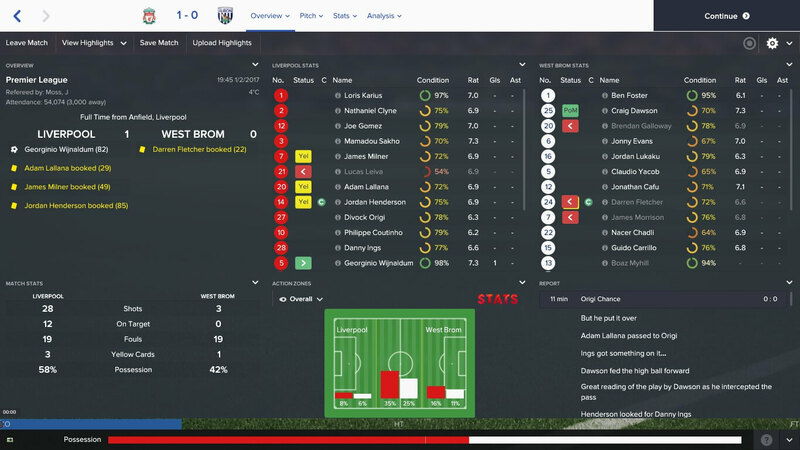 Tony Pulis teams are always difficult to beat, and the Baggies are sat comfortably in mid-table. They arrive at Anfield set up to defend in a five at the back formation. Mamadou Sakho is in for the injured Joel Matip while James Milner starts at left-back with Alberto Moreno still suspended. Emre Can is also sitting this one out after reaching the yellow card limit meaning it’s Lucas Leiva’s first appearance of the season. I didn’t think we were going to score. We hit the woodwork on four occasions with the visitors failing to register a single shot on target. 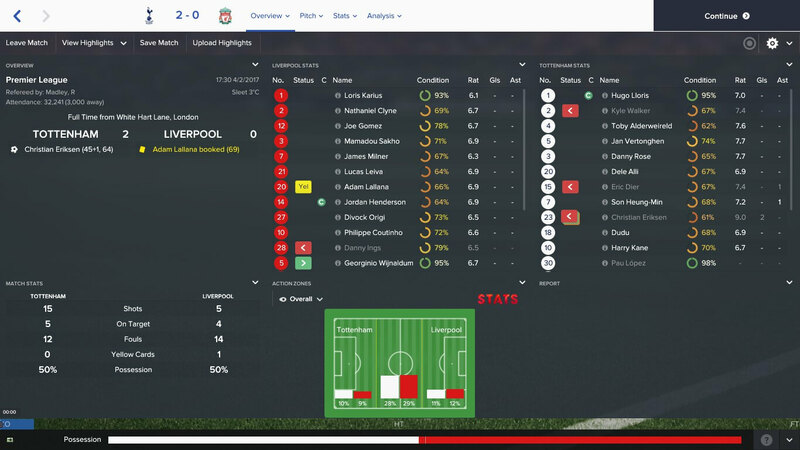 Up stepped Georginio Wijnaldum with another goal off the bench. The Dutch midfielder brought down a long ball before volleying past Ben Foster. We deserved this victory, and despite the narrow scoreline, we were in complete control of the game. We lost Lucas to injury, but he should be fit for the Tottenham game. Just three days later, we face a difficult trip on the road to Tottenham. As I have mentioned, Spurs are behind us in third and can cut the distance to six points with a win. They are at full strength for this fixture while we have key players missing. I would take a point as White Hart Lane is always a tough place to go. We are unchanged from the West Brom win. Not the result I was looking for, but I can’t say I’m surprised. Tottenham are on a great run at the moment, and Christian Eriksen was in fine form while we were missing some key members of the squad. Ings is not good enough in the false nine role and Origi is not suited to the inside forward position. Loris Karius had a shocker in goal which didn’t help our cause. The whole side wanted to bounce back with a win, and a home game against Swansea is the perfect opportunity to do just that. The Swans are stuck in the relegation zone and are without a manager after dismissing Bob Bradley. It should be a routine victory, and we welcome back many important first-team players. Matip, Moreno, Mane and Emre Can all return. We are back to winning ways after a comfortable home victory. 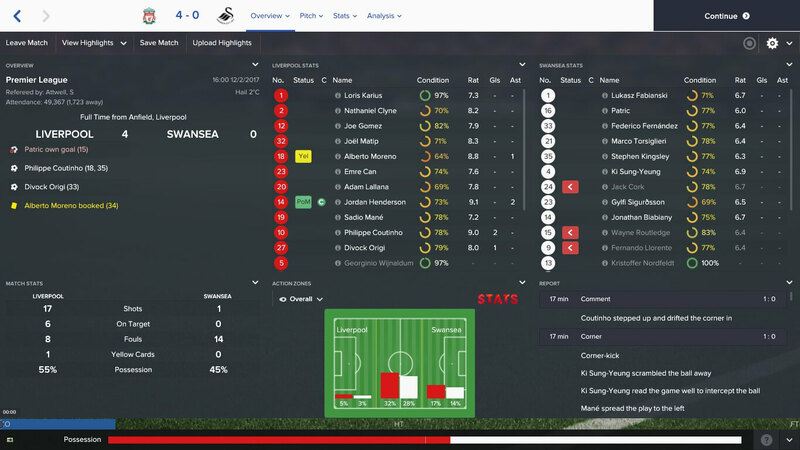 Swansea defender, Patric, helped us get off the best possible start after diverting Mane’s cross into his own goal. Philippe Coutinho was exceptional and added to the score line just three minutes later. 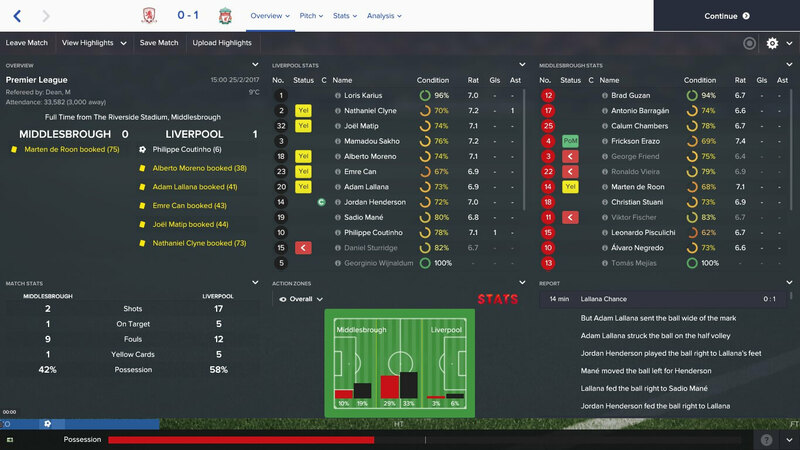 Origi and Coutinho scored again to wrap up the game before half-time. I told the lads to take their foot off the gas in the second half with the points in the bag. The international break has ended, and we return to action in the Premier League. The added recovery time has allowed Sturridge to return to fitness and I will be giving him a start against Middlesbrough. Karanka’s men are sat rock bottom of the table and relegation is already starting to look like a certainty. Sakho replaces the suspended Joe Gomez. Another game which we dominated but couldn’t convert our chances into goals. Coutinho’s sixth-minute wonder goal was enough to seal the win as ‘Boro didn’t threaten. Sturridge looked off the pace, and I might have to ease him back into first-team action. The win keeps the pressure on Arsenal who are entering a tough run of fixtures which could give us the chance to overtake them. Overall, February was a successful month for us. We kept three clean sheets and picked up three wins from four. The loss against Tottenham was disappointing but knew it would be tough to get a result at White Hart Lane. We are back to full strength after some injuries meaning March’s fixtures are the perfect opportunity to gain ground on Arsenal.